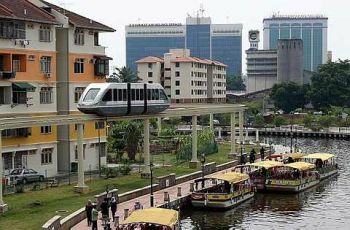 MALACCA: Barely two months after its grand launch to mark Malacca’s developed state status, the city’s RM15.9mil monorail line has ground to a halt owing to a host of problems. Launched on Oct 20, the monorail has been idle for a month after developing problems with its wheels and software system. The China-made monorail line, spanning 1.6km from Taman Rempah in Pengkalan Rama to Kampung Bunga Raya Pantai along the Malacca River, is part of the state’s aim to tap the potential of the river as a tourist attraction. Project under scrutiny: The monorail line is part of Malacca’s aim to tap the potential of the river as a tourist attraction. Chief Minister Datuk Seri Mohd Ali Rustam had launched the system to mark the recognition of Malacca as a developed state, 10 years ahead of the national Vision 2020. Hours after the launch, however, a coach with some 20 passengers stalled about 100m from the Hang Jebat station. Operator Menara Taming Sari Sdn Bhd used a skylift to rescue the stranded passengers. The project is a joint venture between the Malacca Historic City Council and state subsidiary Kumpulan Melaka Bhd and Agibs Engineering & Construction Sdn Bhd. The Tourism Ministry has approved an additional RM13.2mil for the monorail phase two extension project under the 10th Malaysia Plan. On Thursday, a visibly upset Mohd Ali said four engineers from China were trying to iron out the problems affecting the monorail. “Some screws keep breaking and the rims of the wheels had to be replaced. “We hope the engineers will be able to fix it within a week,” he told reporters after closing a refresher course for National Service trainers at Permata Resort Camp in Alor Gajah. He said if the monorail continued to face problems, the state government would not buy additional monorails from China for the proposed extension project and would, instead, source them from Europe. Menara Taming Sari chief executive officer Nazry Ahmad admitted the monorail had been out of service due to “several technical and mechanical problems”. “We have been facing problems with the monorail on and off since it was launched. It is now closed to the public,” he said yesterday.